Personally I like this one and thought author David A. Yallop did a good job of writing Terry out and writing Ray in. Of course it is sad to see the back of Terry and the scenes of Arthur alone in Terry's flat. Having watched it many times since first broadcast, I feel this episode marks a new era to the show where the emphasis is now more on 'family' (Arthur being unable to treat Ray as badly as he did Terry) and the timeshift of the show into the 1990s. The clothes, the cars and the look'n'feel are now different in this episode but I believe the writer did will to evolve Minder into this newer version of the show. There will always be people who say that Ray is not Terry and with Ray this is a poor imitatation, but I have to disagree and can enjoy the Gary Webster shows just as much as the Dennis Waterman shows. The Loneliness of the Long Distance Entrepreneur is of course is the only episode where Terry is referred to throughout the whole of the three Ray Daley series. We see the introduction of lots of new characters, including new coppers Morley and Park, Arthur's brother Bert & his wife Doreen as well a new Winchester Club set with a 'prevaricating' Dave. The story is pretty good where Arthur accidentally gets caught up in drug smuggling from the continent via a the sale of a car to Detective Sergeant Morley. A punch up, a con, some dodgy villains and a European element all make this a pretty good story overall. "What is this? National Judas week?" "Not now Dave, I'm grappling with major aggravation". Ray: "Just nicotine and alcohol?" Arthur: "Absolutely, I mean you gotta have some standards, haven't you?" Watching this episode today on ITV4 for the 1st time as my DVDs are only the Terry years and I usually skip the Ray years on telly. Great opening episode and loved it when Ray belts the heavies and the music starts, think I'm gonna enjoy these! Stick with it t64. I think series 8 has a few weak ones but favourites for me are "The Last Temptation Of Daley", "Him Indoors", "Too Many Crooks", "The Odds Couple", "The Cruel Canal", the excellent "The Coach That Came In From The Cold" and of course this episode where Ray is the cat's whiskers! The Sunday Mirror article on the minder.org link shows both her & Emma Cunnigham (who doesn't appear until the next episode) were involved in a bit of series promotion at the time. This was a great episode, loved the nod to the Godfather in the opening scene where Arthur's holding court in the men's cloakroom. Arthur underestimates Ray, and is pleasantly surprised when he proves to be capable minder material. Terry's absence at the flat felt quite chilling and really marked a tonal shift in the series for me, where it shifted to (as jno has rightly pointed out) more of a focus on family. Wasn't too big a fan of Morley saying that he'd been after Arthur for many years, though. This was a good episode, the Ray years are a little different to the Terry series and moved on with the changing times of the 90s. It would have been great to have cheerful Charlie and taff Jones as the old bill. I agree the Ray years are still fantastic telly bar a few episodes being a little weak but I still love them all. After completing the Terry years I have just finished watching the first three Ray Daley episodes, for some reason I have never caught them much on ITV4, so virtually watching for the first time since original transmission. I thought this opening episode was very good, I loved the way Arthur was holding court at the wedding like some big mafia boss. We find out what happened to Terry and see young Raymond coming into the series, two very tricky storylines which I thought were done very well. Even though I remember this episode very well and know he doesn't appear, I was still hoping for a final scene with Arthur and Terry, but the part where Arthur pushes the money through the letterbox, but removes some from the bundle first was classic Minder and sort of tidies things up from the Terry years and you sympathise with how Terry had to go to Australia to escape the clutches of Arthur. The Ray Daley years really got me hooked on Minder and I have no issue with these episodes at all and looking forward to watching them again. I even bought a red jacket similar to the one Ray wears in the series back in 91, I was a dapper dresser back in the days when I still had some hair. Great stuff daz - as it happens I also had a red jacket around 1992ish and boy, how much did I think I was as cool as Ray Daley wearing that out and about?! One of the very few episodes where Minder goes outside the UK with shots of Brussels. Every year for the past 15 I have driven right past that spot where Arthur & Ray have a hot dog near the ferry port. I am always in such a hurry I never get chance to stop and get out. I do give it a nod as I drive past though. One day though, with hot dog in hand, ... watch this space. I've always meant to go for a stroll down Southend pier, but never made it yet. Being a Scotsman though there will be no chance I leave my wallet back at the pub though! Had to smile at the comments about wearing those red jackets! I also bought one in 1991 and vividly remember wearing it out and about on a family holiday to France and thinking it was super cool and smart at the time! There was a time when they seemed really fashionable and many times I used to think of the Gary Webster years Minder theme music when wearing it! I wasn't quite brave enough to wear those shirts Gary wore though! I tried to wear that red jacket as long as possible and was wearing it at uni as late as 1998, no doubt a few years after they were fashionable! The funny thing is though, none of my mates were aware of why I wore that jacket as they didn't watch Minder! It came as a big disappointment a few years ago when my mum told me both of my red jackets (yes, I even bought another one in about 1995 as I was got taller) got chucked out in about 2000 as she always thought they made me look like a bus driver who'd had just lost his badge!! That's a great article above, I've never heard of Dennis's quote about "Arthur being a nice part for him, as he's getting on now" before! Going back to the topic though, overall I thought that the transition to the Ray episodes was very well written. 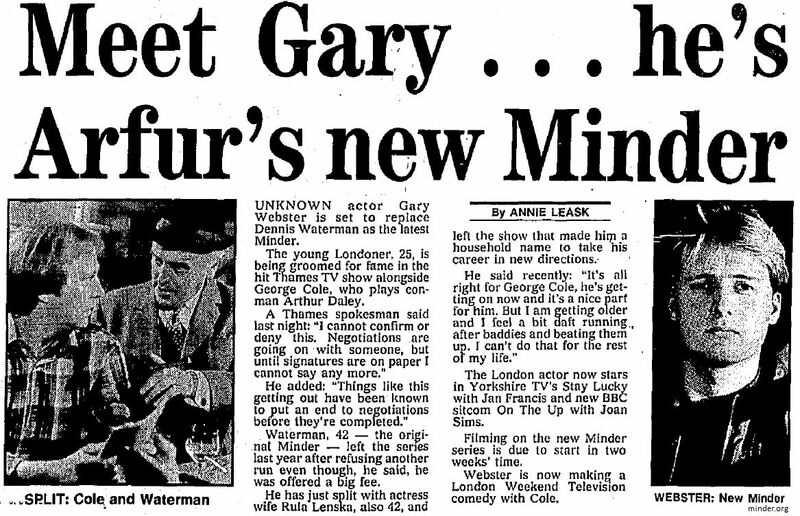 I still remember very well a very short trailer for the first Ray episode (I think filmed at Arthur's car lot) which went out exactly a week before at 9pm the first Ray ep and I remember how excited I was about a new season of Minder. I remember many years ago writing a fairly long post on here about my 'varying perceptions' of the Ray eps but overall I thought they were great and anyone who doesn't watch them is missing out. In a nutshell though, when they first came out I guess I tended to think they weren't as good as the Terry years. Then, when I watched them again on DVD about 12 years later I was pleasantly surprised at how good they are. Hence perceptions of these years tend to very but in the cold light of day, some Ray eps are better than others and to be fair some Terry eps are better than others too. For many years up until a few years ago, I used to think that every DW ep was absolutely brilliant but in reality, some eps are better than others, which is true of The Professionals and The Sweeney too. The overwhelming impression I have of the Ray years though is how modern they feel as I was 14 when they came out first and it feels more like 15 years ago than 25 years to me! Whereas I was only 2 when the DW eps came out so even the very last DW eps first shown in 1989 seem a very, very long time ago! Interestingly, I honestly can't remember at the time wishing that Terry appeared in the first Ray ep. Maybe it was because I was just keen to see Arthur again or because I knew from press interviews that Dennis wouldn't be appearing in the new series. Looking back though, it would have been great to have had Ray and Terry both appearing, even if Terry was only in it for a couple of minutes. All in all though, a top ep and the whole plot of importing a car was very topical at the time. I just started watching this for the first time. I'm only about ten minutes in and so far it's great! Arthur is in rare form even for him. I like the way he corrects Ray and claims to be a Major of Industry. I was skeptical of Minder without Terry. Terry and Arthur and Dennis and George are both such amazing teams. I was afraid the magic would be gone. Not a bit of it. I really enjoyed the episode and thought it was one of the best episodes. The Arthur/Ray dynamic works extremely well from the start. I love the opening and the way it spoofs The Godfather. George Cole is a superb as ever as he holds court in the cloakroom-toilet. I liked the lines about the dodgy watches from Yokohama and Arthur selling a number of original dresses to women at the wedding as well as 'Er Indoors. The rest of the episode maintained the high standard set by the opening. Morley makes a worthy adversary for Arthur. Ray is a good character and I look forward to watching more of his adventures with Uncle Arthur. Terry's departure was handled well and the scene with Arhur realizing he's gone is poignant. I can remember watching The Loneliness of the Long Distance Entrepreneur, when the episode, was first shown, but probably enjoyed watching the episode more, on second viewing, even now, I can still remember, when watching this episode, I couldn't believe there would be no more Terry McCann, in Minder, and hoped that Dennis Waterman, would return to the series, one day, I also missed Chisholm, Jones and Melish, Peter Childs (Rycott) had of course, sadly died in 1989, I did however, soon get used to Ray Daley (Gary Webster), being the new Minder, and grew to like his character, I also soon got used to the other new characters, who appeared in series 8. I wonder who the Belgian actor who stood in for Ray was? I used to think Arthur had left his wallet behind, but i read somewhere that it is huis lighter he has left behind, and being too tight to get a new one, he goes back to get it! It seems Arthur has a sister? 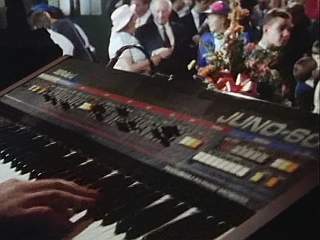 In the opening wedding scene, ''Yesterday'' is being sung and Doreen asks Bert why? Bert stutteringly indicates it was a request. Doreen replies ''I bet it was from that sister of yours?'' Logic would dictate that Bert's sister must also be Arthur's sister(or half sister at least). We get a fleeting glance of her as she loads up at the buffet. I don't recall her being mentioned in any other episode, nor do we find out her name. I certainly can't imagine Arthur calling her Sis. This is a good episode with a good plot after the intro of Ray. Ray is a great character working with Arthur. But I thought it was a bit silly that Terry would emigrate without telling Arthur. And Terry's flat seems a bit grotty compared to his others. Maybe an episode more for myself if I were ever a teenager back then. I've bought the Season 8 DVDs and have them in the post and I've started watching this since people are talking about this. I think it's clear that they've written something very adventurous for Ray and more of this world from the start and he really has it rough and looks laid back as ever. 5 out of 5 for me because it's clearly more of my type to watch and be entertained. 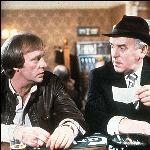 However it is clear that I missed out how the world of Minder has been widen alot and it's noticeable, so it does make me wonder much Minder has covered. I really really wanted to know how Ray entered into the series. I couldn't help myself. Stand on me westlndr - you'll love it. Hmm okay... I will. Try have to post more to reach and go above you on post count. I've noticed and thinking about the way they written out Terry out of Minder since it's common to write out characters who don't want to perform on long running shows. How Terry was fed up with Arthur, found someone and fed to Australia with that other woman (not spoiling who she really was) going after Arthur regarding Terry. They've made it out like Terry was not honourable because with the way Australia was founded and used for, if anyone's noticed. How that woman was going after Arthur on behalf of Terry. The show portrayed Terry as a coward. Maybe it was just a way to hit or hint out to Australia until they started filming a few Minder episodes there. I think it's interesting. Possible. I agree the woman going after Arthur was a bit out of sync in relation to how Terry would have dealt with Arthur. I watched this for the first time since Original transmission. UK Gold didn't show it during an afternoon repeat season in spring 1996, which was When I really began to appreciate the Day years in their own right. A very good episode to start. The newer cast fitting in well with George and Glynn. 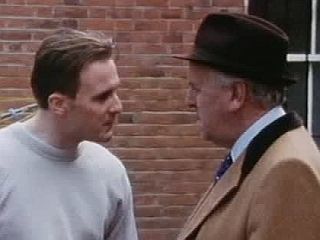 The best scene in that is that pub fight which ends with "I don't think you met my new Minder Ray Daley....'e's family!"